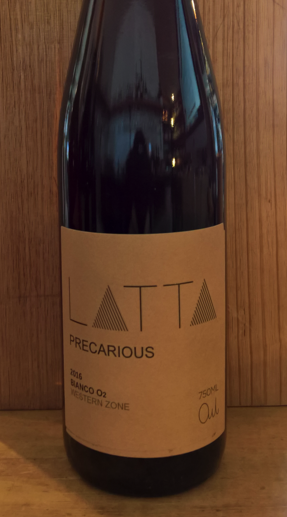 2016 Latta Vino 'Precarious' Bianco O2. Western Zone-VIC. 60% Sauvignon Blanc with 20% Chardonnay 10% each of Pinot Noir (no skin contact) and Viognier. Whole bunches of Gewurztraminer were also added to the ferment for extra texture and aromatic complexity. Deliberate oxidative winemaking with minimal sulphur adds. Indigenous yeasts, unfiltered.